There are probably a number of winemakers who describe their wine in this way. There is certainly at least one: me. Why most unusual? Well, the vineyard is in London, while winemaking takes place in Singapore. Neither city is commonly host to their respective activity. Why rarest? Because the vineyard has just six vines, all different varieties. The wine is a field blend (though this in itself is not unusual), but the result is a mere two bottles per vintage. 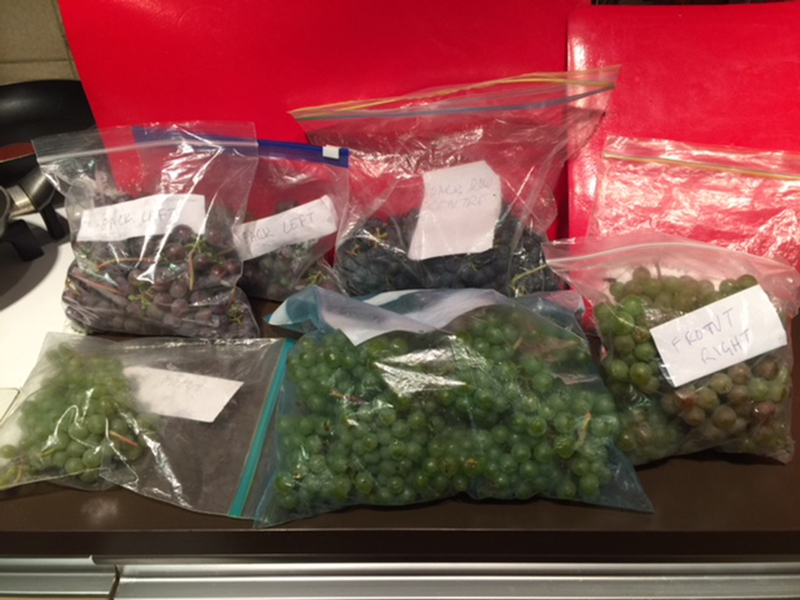 This blog is about the vineyard and first harvest, while the next will be about the winemaking, which is well under way. First, terroir. 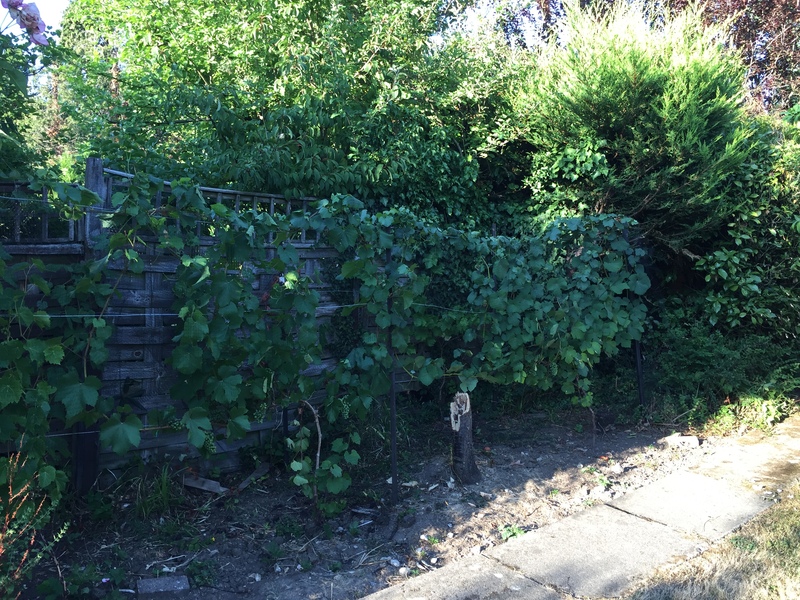 The vineyard occupies part of my back garden in Harrow, London. 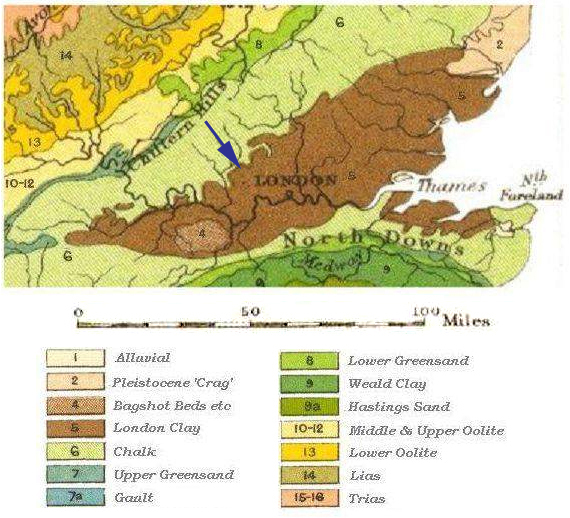 Harrow sits just inside the northern edge of London Clay, a sedimentary layer better suited to brick-making than viticulture. A few centimeters of brown topsoil soon give way to yellow weathered clay; further down is said to be blue/grey unweathered clay, but enormous effort is required to dig deep enough to find out (I have not). Confusingly, our suburb of Hatch End and its neighbour Harrow & Wealdstone do not sit on Weald Clay, which is south of London. Immediately to the north of Hatch End, the clay rises into a long wooded ridge, part of London’s green belt, at the top of which are splendid views of London, the one-time home of librettist W.S. Gilbert, Grim’s Dyke, and Harrow Weald SSSI (Site of Special Scientific Interest). The climate is all too depressingly familiar, with rather too little sunshine and rather too much cold and rain, but climate change has brought both higher average temperatures and more extreme events, so that 2018 was a terrific summer for growing grapes at 51.6ºN. The vines. There is one vine of each of three whites: Seyval Blanc, Chardonnay and Gewürztraminer, and three reds: Dornfelder, Regent and Sankt Laurent. The Seyval Blanc was a substitute for the intended Bacchus, but the supplier, Victoriana Nursery in Kent, was out of stock. That was a bit of a pity, since Seyval Blanc is rather similar to Chardonnay, while Bacchus is closer to Sauvignon Blanc. Technical note: Seyval Blanc and Regent are man-made hybrids i.e. their ancestry includes some non-Vitis Vinifera varieties. EU wine law does not allow hybrids in the production of table wine, though the hybrid Baco 22A is permitted and predominates for making Armagnac. Dornfelder is a man-made cross of two Vitis Vinifera varieties, Helfensteiner and Heroldrebe. In turn, Helfensteiner is a cross between Frühburgunder/Pinot Noir Précoce and Trollinger/Schiava Grossa; Heroldrebe is a cross of Blauer Portugieser and Blaufränkisch/Lemberger. All these hybrids and crosses have been designed to grow well in marginal cool and wet climates. The ‘thoroughbreds’, Chardonnay, Gewürztraminer and Sankt Laurent, are also cool climate varieties. The saplings (all grafted onto phylloxera-resistant rootstocks of course) were planted in the spring of 2015, at about one metre spacing (as dictated by avoiding old tree roots) in a cleared plot. The plot faces south, with a fence behind to reduce wind and trap heat. Soil testing showed normal levels of acidity and the usual nutrients. A conical hole was dug for each vine, about 30-40cm deep, down to very sticky and resistant waterlogged clay. The planting holes were backfilled with a bark/fertiliser potting mixture. The vineyard as at 23rd July 2018. The reds against the fence are barely visible behind the whites, which from left to right are Seyval Blanc, Chardonnay and Gewürztraminer. Taken at 7:30pm, by which time the vineyard is in shade. Vine management. A lot of thought (dithering really) went into choosing a pruning and training regime. Whichever is chosen, it has to be firmly decided in the first season as there are special early procedures to be followed for each method in the first two or three years, and it is not easy to switch at any point. Bush vines were considered, though with appropriate pruning and training to prevent them becoming the usual tangled mass found in most domestic settings. Eventually, it was decided that putting up training wires would be the best way of managing the vines, while still permitting a variety of training methods, and some flexibility to change between them later on. In fact the widely-practiced Double Guyot with VSP (vertical shoot positioning) system has been adopted for now. So at the end of each season, two existing shoots are tied horizontally along the bottom training wire as canes, to the left and right, and all the other shoots are removed. New shoots grow in the spring from however many buds have been left on the two canes, and these are trained up to the top wire. In the summer, bunches of fruit (hopefully) grow on these shoots. Vineyard management. The gardeners, good though they are at pruning roses and otherwise, are under strict instructions not to touch the vineyard. The plot is unirrigated. The fruit is far enough off the ground to be out of reach of squirrels, which from time to time may be seen gazing longingly upward at their coveted dessert. Sometimes there are birds sitting alongside them, which also need obstacles, so netting was thrown over the vines at véraison i.e. when the reds began to colour. Weeds grow rapidly with so little competition and are dug up a couple of times each season. The plot has not been fertilised since planting nor treated in any way, thus no weedkiller, Bordeaux Mixture, biodynamic horn manure (Preparations 500 and 501) or otherwise. The vines are not spoken to, nor prayers for their health said, though we wish them every success and the Jewish funeral saying, “I wish you a long life”. After some baby fruit the same summer as planting, there was (as is usual for young vines) no more fruit until this year (2018), except that the Sankt Laurent didn’t fruit. The Chardonnay had the greatest yield, the shoots having grown rampantly through the summer. 2018 was equal hottest year on record in the UK, alongside 1976, 2003 and 2006. Picking was done much too early owing to domestic travel arrangements, on 29th August. As a consequence, sugar and phenolic maturity are low. Brix was 12.8 i.e. 12.8% sugar content by weight, equivalent to about 7% abv if fermented to dryness (thus just making the EU legal minimum). This has been adjusted upwards during winemaking. The yield was 2.5 kg of fruit, which reduced to 2.2 kg after selection of healthy fruit and destemming. A further 0.5 kg of red table grapes (most likely Flame Seedless) was added, enough to guarantee two bottles of wine. of which white 45%, red 55%. So a field blend should result in a pale-ish red wine, perhaps like clairet, or somewhere between a typical red and a dark rosé such as from Tavel in the Southern Rhône (commonly made by allowing long maceration for part of the must and blending in a proportion of that to the paler juice). All will be revealed in Part 2. Salut!